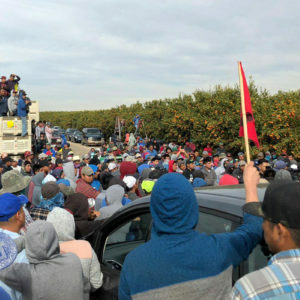 Civil Eats spoke to Gumpert recently about the book, the farmers and consumers involved, and the broader landscape in which the “battle for food rights” is taking place. (The interview has been edited for brevity). Can you give us a brief lay-of-the-land? How has the food rights movement you write about changed in recent years. 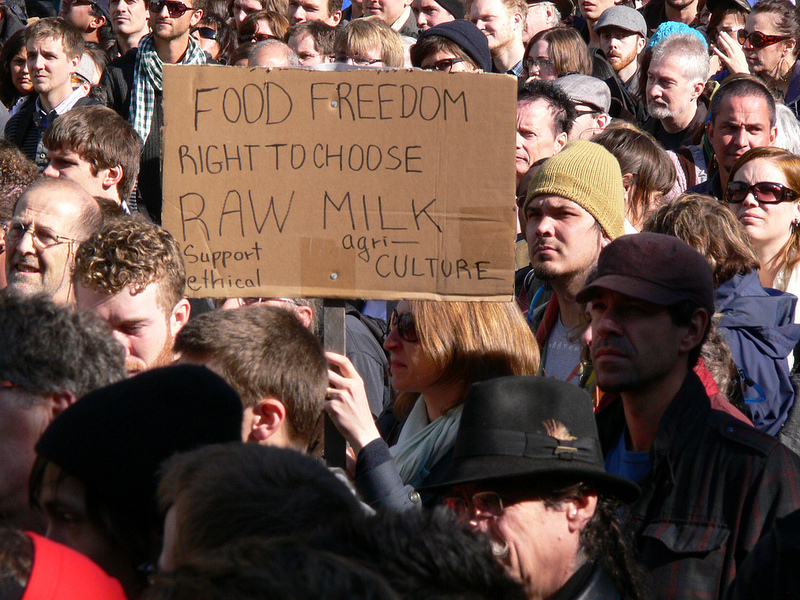 The movement has gone from being about raw milk to becoming something more broadly based. The efforts to restrict access to nutrient-dense food are not just about raw milk. Indeed what we’re seeing with many of the legal cases I’ve written about is that they’re trying to stop farmers from selling any food outside the public food system. I also think there’s a lot more awareness. A number of the legal cases I talk about in my book have gotten a fair amount of media exposure, especially in the communities where they’re happening. We had a situation with the trial of one of the farmers I write about–a Wisconsin farmer by the name of Vernon Hershberger. He was accused of three misdemeanors and went on trial in May. When the county assembled 90-100 prospective jurors and they asked them how many had heard of this case, almost all of them raised their hands. You’ve been writing about this topic for several years now–on your blog and in your first book, The Raw Milk Revolution. Was there anything that really surprised you in the process of writing this book? I was amazed by the depth and intensity of the government’s campaign against these farmers. I have always found it kind of strange that they would take this so seriously. When I started looking into it and got a hold of some of the internal documents, it was just astounding how much effort they have been devoting to countering these private sales. In the case of the Food and Drug Administration (FDA), that has meant sending undercover FDA agents into the homes of people who served as drop-off points for the milk (such as in the case against Daniel Allgyer). In the case of the California Department of Food and Agriculture (CDFA), they’ve gone as far as outfitting investigators with video cameras to take to farmers’ markets to try to implicate a farmer selling dairy and meat products privately. Do you have a sense of how time and resources these regulators are spending investigating private food buying compared to the amount of time and resources they’re spending looking into larger, more industrial settings? I don’t know how the hours stack up, but I’m certain that the intensity of the investigations of larger business are not anywhere near what they are with the smaller outfits. In one striking example, you describe two women showing up in military fatigues at a farmstead cheese company in Missouri. Have you heard stories of that occurring at bigger companies? I don’t think they do that very often. If so, I’d like to hear about it. The military dress is reserved for very severe cases, where they somehow expect to be met with danger. 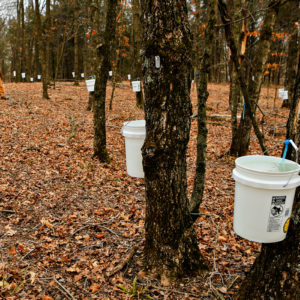 That whole case, and the way the FDA shut down Morningland Dairy Raw Milk Cheese, and made them recall and destroy all their cheese–after only two of their products had tested positive for listeria monocytogenes and there were no illnesses reports–was indicative of the larger landscape. Most recalls are targeted as a single line of food. This family was asked to recall everything they’d produced for the last eight months [and subsequently went out of business]. Many of the stories you tell of farmers selling food privately and the way they’ve been cracked down on are all very similar. Did you come across anyone who’d been able to work with regulators? In fact, a number of them have decided to sell privately because they had difficulty under the public regulatory system. Many of these dairy farmers had been selling to large corporate dairy processors in a previous life and they found that they just really couldn’t make ends meet–the rates the dairy processors pay for milk are just so low. A few years back, before and right after the Food Safety Modernization Act was being passed, there was an ongoing debate about whether the FDA could regulate both big producers and small in ways that were appropriate to each. Now that this set of laws looks like it might finally be enacted, what are the odds of that happening? The act included an amendment that would allow for exemptions for producers selling privately. It’s an interesting precedent that they set; if you’re selling 50 percent of more of your food direct to consumers [within a 275-mile radius] and you’re under $500,000 in revenue, then you don’t have to abide by some aspects of the regulations. The Food Safety Modernization Act hasn’t been implemented yet, but there was a lawsuit by various consumer groups aimed at getting the FDA to work faster to begin implementing it, and a judge ruled on it earlier this year, so they’re working feverishly to get the rules in place. The idea is they’re going to have regulations ready to go by the beginning of next year. This is a mammoth law–not so different that Obama Care–-with thousands of pages of specifics about what’s allowed and not allowed. Can you comment on the incidences where people have gotten sick from eating private food? I write about several cases in the book, including an incident in Washington or Oregon where eight to 10 people got sick from E. Coli 0157:H7 found in raw dairy. Even worse there were some children who got really sick with hemolytic uremic syndrome (HUS), a serious complication from E. Coli. So I don’t mean to suggest that those things don’t happen. And there’s a problem within the food rights movement. There are people who are in denial about those cases and don’t want to acknowledge that those happen. Small farmers have to be as diligent as larger producers. And I haven’t ever seen data that shows whether or not small producers have a lower rate of illnesses than larger ones. What’s the most important message you want people to get from this book? The U.S. seems to come down on its food producers more harshly than any other country I know of–aside from maybe North Korea or Cuba. I’ll ask people I meet where else are these kinds of situations occurring? They haven’t been able to come with anything. And neither have I.
I want people to understand that we are treating our smallest farmers very harshly for doing something that has been done for centuries all around the world: Exchanging food privately. We’re coming down on the people who earn a lot of respect in other parts of the world. Photo at the top by Hella Delicious. 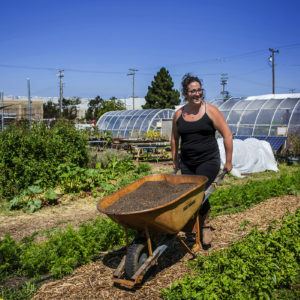 The Farm to Consumer Legal Defense Fund is a good resource for small farmers who are concerned about becoming a target of this kind of thing (and we all should be).